The Kingfisher School is delighted to announce the exciting news that our school community will be joining together with Venturer's Academy, another school within the Trust. Venturers Academy, located in Withywood, is recognised as a centre of expertise and excellence in providing a high-quality education for children with a primary diagnosis of autism. Venturers' Academy St Anne's will be located within The Kingfisher School building and there will be some fantastic opportunities for students from both schools to work together. The main benefits of the co-location will be access to additional resources and expertise for The Kingfisher School students and staff. All children and staff will have access to a range of wellbeing therapies including mindfulness sessions and music therapy. Venturers' Academy St Anne's will be opening in September 2019 offering places to 36 children, primarily Reception and Key Stage 1. The Kingfisher School has seen first-hand the numerous advantages of co-locating with another educational setting, since we have been sharing facilities with St Anne's Park Children's Centre for many years. This is a model that offers enhanced opportunities to the entire school community, with a positive impact on students as well as staff. Members of the Trust have met with Parents and Carers of The Kingfisher School children and the news of the collaboration has been generated great excitement and interest for the future of education for all children in the local community. 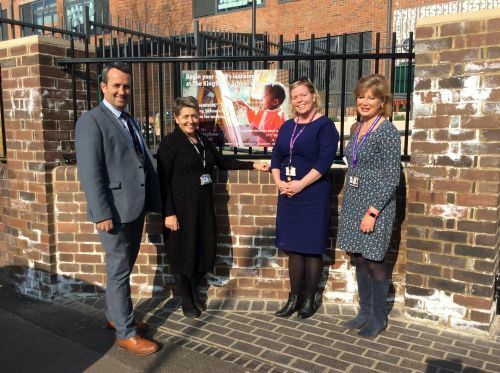 Pictured below are (L to R) Trystan Williams, Principal of Venturers' Academy and Executive Lead for Venturers Trust, Gail Bragg, Chair of Trustees for Venturers Trust, Kirsteen Craig, Principal of The Kingfisher School, Melinda Baker Chair of Governors for The Kingfisher School.